The ultimate keyboard has arrived. With two Half Keyboards embedded into a standard keyboard, you now have the ultimate in flexibility. Type with one hand or two, you decide. Mechanical key switches.. 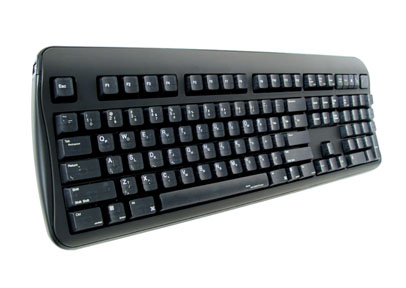 The Half-QWERTY keyboard uses high-quality Alps mechanical key switches, with enhanced tactile feedback for greater comfort and faster typing speeds. With its unique Hydra Cable, the Half-QWERTY Keyboard works with both PCs and Macs (including older ADB Macs). The Hydra Cable has 4 connectors: PS/2, USB, ADB, and an ADB passthrough for connecting additional ADB devices. Plus: there are no adapters to lose. All 4 connectors are directly attached to the cable, so you never have to worry about lost adapters. For quickly attaching USB peripherals, nothing beats the convenience of an in-keyboard USB hub. No more reaching through the tangle of wires behind your computer to download photos from your digital camera. Just plug it into your Half-QWERTY Keyboard and you're ready to go. Works great with MP3 players, keyring hard drives, joysticks, and mice too. Non-US keyboards are a little different. They have an extra key in the lower left corner (right next to the Shift key). While the Half-QWERTY Keyboard doesn't have this extra key (it's a US layout), it will let you do this key by typing double-Shift-Z. The keyboard can also remap to whatever layout is standard in your country, by simply choosing the desired layout from the appropriate control panel on your computer. The Half-QWERTY computer Keyboard is built around a rugged metal keyframe that's designed to last. It comes with a 10 year few-questions-asked warranty, but should last much longer.